We get a lot of questions about curing soap. The typical thought of our callers is that soap is dangerous until it has cured for 3 to 6 weeks. This is dangerous thinking! Soap is a fantastic chemical reaction between a fat and an alkali. The resulting product is a synergy of these two items, fat + alkali = soap. In times long ago many items were cleaned with fats. Can you imagine cleaning with fats and oils? Most likely you can’t. We all know how harsh some modern chemical cleaners are, and we often wear gloves when using these types of products. Soap is a wonderful blend which is greater than either of its components, the synergy that sparks our interest and excites our minds. So, how does one tell when their soap is cured and why is curing needed if the soap is not dangerous? First, it is important to understand the phase we call cure time or curing. This length of time is location and weather dependent. Curing is used to have each bar of soap come to an equilibrium of how much water the soap retains, a balance between soap and atmosphere. Curing is to allow each soap to dry to the fullest extent allowed in each location so the resulting bar can last as long as possible. When using soap that is 24 hours old we know the soap quickly reduces in size because too much soap is being used at each washing, the soap is dissolving too quickly and going right down the drain. Keeping a cured soap dry between uses is important. So, curing is essentially dehydrating. Because we are not adding any other means than maybe a fan in a room with good air circulation we don’t think of this as a mechanical means of dehydrating, but drying is nonetheless what is happening. How does one tell the soap has cured? Easy! Use your scale! A scale is the most valuable tool we use in making soap. Some would argue that they could never give up their immersion blenders but I will argue that there is nothing to blend until the weight of the oils and fats is known. I’m not the most excited person when thinking of hand stirring a large batch of soap, but I certainly will draw the line that my scale is my most valued lab tool. So… how do we do this? CURE CARDS to the rescue! We printed a quick reference card to help you with your record keeping. 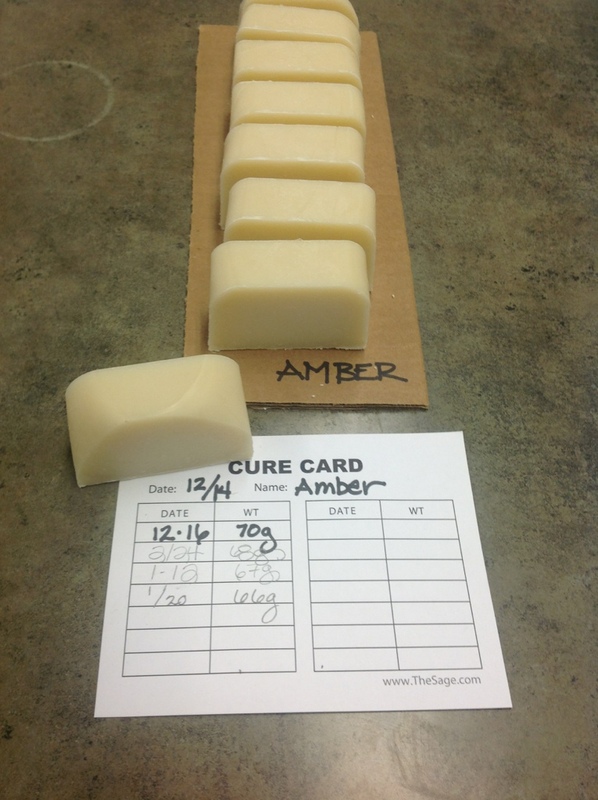 Each pad has 50 sheets of of CURE CARDS, peel one off and use with each batch you are curing. Write the name of the batch and date it was made. Then stack your cut bars to dry. Pin the card down with the lead bar in each curing stack. Weigh that lead soap every few days and record the date and weight. When your soap stops losing weight then your soap is fully cured! These card packs are now in our catalog and can be had for free through our Free Gifts and Teas program. Isn’t this great? I am really excited to share my no-fail method of knowing when a soap is cured. Once your soap has cured, keep this CURE CARD in your records so you will know how long the batch has cured before being wrapped for sale. You do keep records, don’t you? This is one of those V-8 moments! I have those too! I agree with Cee. It never occurred to me to weight the curing soap. I would normally give it 2-3 weeks, box it and wrap as necessary. We live in a dessert so soaps cures fairly fast here, non-the-less, weight would be the most precise method. If the soap has gone through gel phase the chemical reaction is complete. I don’t like the tongue test, the moon test, the stand-on-one-foot-and-sing test, etc. I just weigh the soap and go. I also like warmer temperatures when starting to make soap so I know the chemical reaction that can happen in my mold is as complete as possible. Delaying or slowing the saponification reaction is not something I like. So…. off to make soap then shower! HA! I’ve done that before. No worries! These look pretty handy. They would be great to have. I am going to have to pick some up next time I shop. I think I’ll have to start keeping track. Cards are such a cool idea! I’ve always weighed and made notes but it never occurred to me that the soap was done curing when it stopped losing weight. Awesome! I am glad you have taken on the misconception that soap is caustic for several days/weeks after making. While I usually wait a few weeks to let my bars harden I have also been so excited to try a new fragrance that I have taken a bar into the shower the next day. The idea of weighing is so brilliant and yet so simple it had me slapping my forehead and going “why didn’t I think of that”. Great idea! I will have to try this. Thanks! This is absolutely amazing!!! I shared your link with one friend, as soon as I read your post. Thanks so much for this tip!!!!! I am curious, does the cure method also relate to melt and pour soaps? (letting them cure until no more weight is lost…) When I used to buy commercial bars of soap, I used to unwrap all of them and left them in a pretty basket. They lasted sooo much longer that way. No, it does not relate. Melt and pour soaps are done once solid and completely cooled. I am just venturing into soap making and was wondering how to get the cure cards? Thanks. Looking forward to soap making. You can get them in our catalog: https://www.thesage.com/catalog/Equipment.html#CureCards. This is a great article about curing. I too deem my scales as my most valuable tool in my Soap Lab (The Laundry). Recording the information is the way to go from now on here ! Thank you for a wonderful article ! Thank you! I really like taking the difficult process and making it simple. This is great. I log everything about my soap but I never thought of doing this. I may be overmixing my soap because it does harden up very fast. Being a novice is that usual or should I hold back on the stick blender? A batch of soap that hardens quickly can be difficult to diagnose. Start with checking the lye amount. Use the Lye Calculator on our site. If you are using too much lye the soap will harden very fast. If the lye is OK then check for other ingredients that accelerate trace. These temperamental products could be lanolin, beeswax, castor oil, some fragrance or essential oils, excessive speed in mixing, starting temperatures too high or additional sources of sodium. If you have none of these issues then blend/hand stir with your immersion blender. For every 30 seconds it is on, allow 30 seconds of hand stirring with the same tool (off position). If that does not change how fast your soap sets up let us know your recipe and we will start the search with you. “That’s a great idea, Tina!! I’ve always let my soap cure for 6 weeks and I never thought to check their weight during the process!! I’ll definitely start doing that!! Great idea!! Thanks for sharing!! Is there a specific kind of scale to use. What are the best kind of gloves to use when handing curing soaps? You can use any scale that you currently have on hand! If I’m checking soaps that I’m going to keep for personal use, I don’t use any gloves because the saponification process is finished by the time I cut my soaps. If you are selling your soaps, I would recommend any latex or nitrile disposable gloves to keep the soaps clean for a good manufacturing practice. If My soap doesn’t lose any weight for say a week, then is it ready? I am finding that lots of them seem to be staying the same every day after about 3 weeks. Heather, once your soap stops loosing weight, it is fully cured. Other than drying more so that it lasts longer, could I use this soap now? Then, I made a batch of CPOP yesterday with 15% Shea Butter, and it too is coming out at around 7 pH. Other than it hardening up, can I try it? Does the curing affect whether or how it lathers? Hi GVKW, and welcome to soaping – we are excited you are beginning this journey! Your CP soap is safe to use now. Curing longer allows more of the water content to evaporate, which results in a harder, longer lasting bar. A trick to knowing when the soap is fully cured is to weigh the bars every few days. When they stop losing weight, they are fully cured. But it is not necessary to wait for full cure. When the pH has reached 6-7, the saponification process is complete (usually within the first 48 hours) – it has become soap! Congratulations, and enjoy your creation!